You may have come a long way. You may look back with great satisfaction at your progress so far. You may have learned a lot over the years. You may be wiser and have more to offer than you once did. You may have just landed a big sales, gained a big promotion or completed a big project. You may have delivered results greater than you (or anyone else) thought were possible. You may look at the lives of others and think that you have achieved much more than them. You may think that you have made a bigger contribution than most of the population. You may have made a significant impact on the world. There may be others who are singing your praises and are grateful for your contribution. 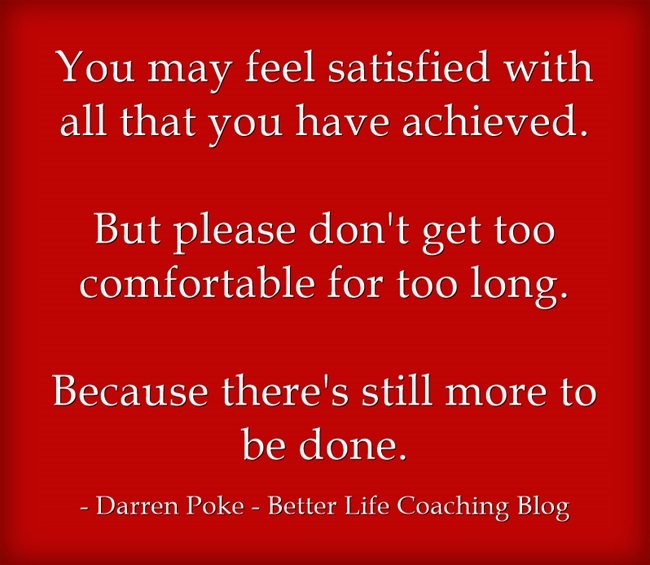 You may feel satisfied with all that you have achieved. But please don’t get too comfortable for too long. Because there’s still more to be done.